Update: Just finished playing several rounds with my wife. Wow, the game play is extremely smooth. We mainly played vs. and the two-player simultaneous mode. Watch out during simultaneous, as the second player can shoot you from below. My wife did this a few times and claimed that it was accidental, but I'm not so sure. Edited by sramirez2008, Sat Aug 20, 2016 5:45 PM. I don't have a second trakball to test. I noticed there's a two player coop and two player competitive. What's the difference between these options? Almost reminds me of Joust and Balloon Fight where you can work together or try to annihilate each other. If both players are simply holding the fire button, you'd be hard pressed to swap sides without crossing the line of fire unless you're both riding the rail. Doesn't the post above yours answer your question? You can shoot the other player from below? Mine has not arrived yet. How do you open the CX80 Trak-Ball? If screws are under the rubber, is it sticky enough to replace and stay put without cleaning and new adhesive? I hate when one or more rubber feet are missing on trackballs and Starplex controllers because they work best for me on a table surface. Things I hold like joysticks I don't care so much about the feet. The two player co-op maintains separate scoring and allows you to kill one another. Team Play combines both scores and doesn't allow you to kill one another. Yours may be different, but in my case, the double sided stickers under the rubber were sticky enough to stick the bumpers solidly to the table I gently set them on while I had the CX80 open. I've now had it open about four separate times, and the bumpers are staying on the CX80 without any new adhesive added. Edited by fluxit, Mon Aug 22, 2016 2:50 PM. Possible to get this game without the screen border? Be nice if it were omitted... in an 'icing on the cake' sort of way be even more arcade-like then. Screen border doesn't bother me any but should be an easy fix. Thanks for the heads up Trebor! Looks like there are some graphical changes too. So if we want the 7800 Arcade version, can just order a custom 7800 cart then. Or wait for Concerto. Is this the same one that was put together by the dude that programmed b*nq? If you mean Ken Siders, then yes. He did the Centipede TB hack and also programmed the B*nq and Beef Drop VE homebrews. I kinda wish he'd made more though. Both of his homebrews have every bit as much polish as PMP's releases. My one question was why this game took ten years to hit the AtariAge store? Just to clarify, indeed, the trak-ball code is courtesy of kenfused/Ken Siders of B*nQ and Beef Drop (VE) fame. The relatively recent graphic changes (I.E. Removing the border, changing score font, and updates to graphics) are from Defender_2600. Cool. I think I had Shawn or someone make me a copy of this a very long time ago. Hmm. This will go on my "Mateos Rewritable Multigame 7800 Cart" as soon as it arrives. 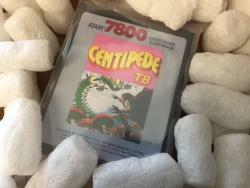 No such thing as too much Centipede! In August, I was working on an interesting update but then I've been busy with real life. I'll try to make some progress this weekend. Received my copy yesterday along with ReBooteroids for the Jaguar. It plays like a dream with my CX-80! Now I just need to find another trak ball for co-op play! The co-op play is a lot of fun. Great for when you have friends over. So you mean to say you have "friends?" Being an adult retro gamer, especially one without kids, one may find that while they do have friends in the real world, most of them are not gamers or have their own lives and do not have the time to "hang out" and play. And if your spouse/SO is a non-gamer, what then? Even my best friend who on rare occasion comes over, is only interested in "NES and up." I have literally a couple of friends left that come over and play every now and then. I am lucky that my wife has several favorites, one of which is Centipede. She's also into 5200 Tempest because of the trak-ball, so trak-ball games have been a hit in our household. Out of curiosity I was wondering if anyone who owns a copy of Centipede TB could tell me if it has joystick control support as well as CX-22 trackball control support, or did the hack completely remove the option for joystick controls? I ask because it looks like a fun game for co-op play but I only own one trackball (a CX-80 that functions as a CX-22) and don't fancy shelling out the money for a second trackball, so I was curious to know if one of the players could still use a joystick while the other played with the trackball or if joystick control support had been removed entirely in Centipede TB. Negative. You can pick up a vintage copy of Centipede for peanuts if you want joystick support. Only downside is you need two trakball controllers to play coop mode. Thanks Kosmic! I figured as much, but hey, it never hurts to ask. I'll still be picking up a copy of Centipede TB for the 7800 in the not too distant future since I enjoyed the 2600 TB hack so much.